Without proper insurance - health, auto, homeowners, life, disability, or long-term care - an unexpected event can quickly derail your financial plans and put your life savings at risk. Insurance is an essential part of financial planning, but many people are paying hundreds - sometimes thousands - of dollars more than they need to, and often, they buy the wrong kinds of coverage. With your family's financial future at stake, you can't afford to make the wrong decisions when shopping for insurance. 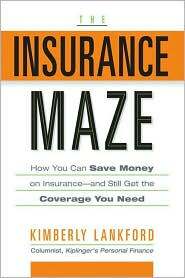 In The Insurance Maze: How You Can Save Money on Insurance and Still Get the Coverage You Need, industry expert and writer Kimberly Lankford breaks through the clutter and jargon of the industry and helps you make the most of your coverage and avoid expensive mistakes that can jeopardize your financial future. As a journalist writing about insurance for more than a decade, Kim Lankford has been investigating the business from the inside and out - writing about sales strategies for insurance company executives and agents atthe beginning of her career, then revealing those strategies to consumers as the chief insurance writer for Kiplinger's Personal Finance Magazine and author of the "Ask Kim" column. Lankford's inside knowledge of the business has made her one of the best-known personal finance writers in the country.